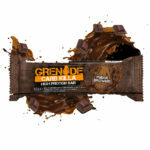 Image for calories in Grenade Carb Killa High Protein Bar Fudge Brownie: Grenade. Source for calories in Grenade Carb Killa High Protein Bar Fudge Brownie: Grenade. How many calories in Grenade Carb Killa High Protein Bar Fudge Brownie? There are 108 calories in a ½ Grenade Carb Killa High Protein Bar Fudge Brownie. There are 215 calories in a Grenade Carb Killa High Protein Bar Fudge Brownie. There are 359 calories in 100g of Grenade Carb Killa High Protein Bar Fudge Brownie. About 33% of the calories in Grenade Carb Killa High Protein Bar Fudge Brownie comes from fat. About 25% of the calories in Grenade Carb Killa High Protein Bar Fudge Brownie comes from carbs. About 43% of the calories in Grenade Carb Killa High Protein Bar Fudge Brownie comes from protein. How much fat in Grenade Carb Killa High Protein Bar Fudge Brownie? There are 4g of fat in a ½ Grenade Carb Killa High Protein Bar Fudge Brownie. There are 8g of fat in a Grenade Carb Killa High Protein Bar Fudge Brownie. There are 13.3g of fat in 100g of Grenade Carb Killa High Protein Bar Fudge Brownie. How many carbs in Grenade Carb Killa High Protein Bar Fudge Brownie? There are 6.8g of carbs in a ½ Grenade Carb Killa High Protein Bar Fudge Brownie. There are 13.6g of carbs in a Grenade Carb Killa High Protein Bar Fudge Brownie. There are 22.6g of carbs in 100g of Grenade Carb Killa High Protein Bar Fudge Brownie. How much protein in Grenade Carb Killa High Protein Bar Fudge Brownie? There are 11.7g of protein in a ½ Grenade Carb Killa High Protein Bar Fudge Brownie. There are 23.3g of protein in a Grenade Carb Killa High Protein Bar Fudge Brownie. There are 38.9g of protein in 100g of Grenade Carb Killa High Protein Bar Fudge Brownie.